Just be happy! : Merry Christmas! Well, this year we decided to stay home on Christmas eve. I'm still very sentimental about the loss of my baby Alex in the beginning of this year, so even though this is the time to be with family and friends, I just want to be with my husband and be able to run to my bedroom and cry if I feel like to. There are lots of snow still outside, we even had a little more falling today, so it's not bad being at home, at least we are safe. Can you imagine drunk drivers trying to get home tonight with all of these icy roads?! Now, what really made my day was the box that the UPS lady dropped off today. 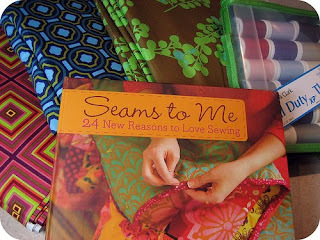 I entered my name on "Seams to me" sweepstakes and won the second prize!!! A signed copy of Seams to Me by Anna Maria Horner, 15 yards of gorgeous assorted fabric, and a thread sampler pack from Coats & Clark - I'm stocked - what a great Christmas present!!! (I can't say anymore that I have never won anything - lol). Well, I better get back to my cooking. I'm making a strawberry cheesecake and a cherry cheesecake pie, since my father-in-law and also my brother-in-law are coming over tomorrow to have lunch with us, which I am looking forward to. Merry Christmas to all of you that visit my blog, I hope you have a wonderful time! I'm glad to hear that you are taking all the time you need to to try to heal your heart. I will say lots of prayers for you this Christmas!!!! Thinking of you from Chicago!! I received the lovely scarves and they were more beautiful than I imagined! Thank your hubby for me, for braving the roads to drop them off. Hoping that your Christmas & family luncheon was blessed & full of joy!